This is a scale model of an early two-seat fighter airplane. It was a French design, commissioned and built in the United States during World War I and ordered in large numbers by the United States Army Air Corps. When the U.S. entered World War I, the Signal Corps had just 55 aircraft, none of which were suited for combat. Georges Lepere, a member of the French Aeronautical Mission to the United States, was tasked by the Engineering Division of the United States Army Air Service to design a two-seat fighter. His design included biplane design with upper and lower wings of equal span and forward stagger. It was made of wood and fabric material and powered by a 425 HP Liberty L-12 engine cooled by a radiator faired into the upper wing. The engine was 12 cylinders arranged in an inline “V.” Armament was two .30 caliber machine guns synchronized to fire through the propeller, with two Lewis guns flexibly mounted on a Scarff ring at the observer’s cockpit. Large orders for the new design were placed, with Packard, Brewster & Co., and the Fisher Body Corporation, for a total of 3,525 aircraft. 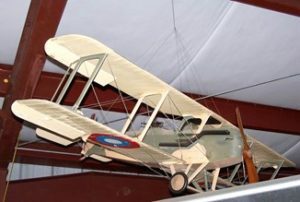 The first prototype flew at McCook Field, Dayton, Ohio, on May 15, 1918. Despite a forced landing due to fuel starvation on its first flight, testing proved successful with speeds of 136 MPH. Only two prototypes and 25 production aircraft by Packard were completed by the time of the Armistice that marked the end of World War I and led to the mass cancellation of the outstanding orders.